Horsehair worms are parasites often described as a “curiosity,” as they are interesting but seemingly without great impact other than to the poor insects they use as hosts. And before going any further, it is best to make clear that these parasites do not use a human host. You can handle them and play with them, without any risk. Horsehair worms are separate from the many other types of worms out there, and are classified as Nematomorpha. Although an estimated 2,000 species should exist, only about 320 species are known to science, so still lots more to be discovered. These worms start as an egg, typically laid in water, which is smaller than small at just 50 microns. This is five one-hundreth’s of a millimeter, or roughly one fiftieth of the size of the period at the end of this sentence. And females can lay over 20 million eggs, a staggering number. The eggs then hatch to become larvae, which are free-swimming and if lucky, get taken up when a grasshopper, cricket or similar insect comes to drink water. The larvae then moves into the insect’s body, and begins to parasitize it. During this time, it will mature and grow. And then out comes the adult worm, as seen in this photo from Bath County, Virginia. 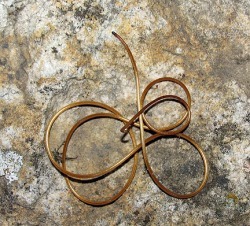 A very long, slender worm that is sometimes called the Gordian Knot worm as it can and does tie itself into knots. The adult is typically 25-40cm long, but can reach over a meter in some species, yet just one mm wide. The adults have no proper systems for eating or waste removal, nor even an organized way to breathe. They just find another adult for mating and then expire. While many parasites are considered pests, this worm is mildly beneficial, as it helps to control some insect pest species.